Gardening on a few acres has given me the opportunity to develop different areas or rooms in my garden. Instead of trying to plant every species together, which is often a big mistake, it’s a good idea to develop individual areas and focus on just a few plants. This type of planting succeeds on many fronts. Whether forest or prairie or seaside, most natural plantings are usually comprised of just a few plants that are repeated. By echoing nature we can develop areas in our garden that have their season rather than trying to have continuous bloom or continual seasonal interest. Some of the seasonal areas that I have developed in my garden are the big-leaf room, herbaceous borders, the orchard, the vegetable and cutting garden, the early spring garden (comprised of mostly lupines, primulas and small tulips), the Limelight hydrangea and phlox area, and one of my favorite seasonal areas: the daffodil walk. Spring can be extremely cold and I am amazed at how long the blooming period lasts for daffodils. Most ornamental trees, shrubs, and perennials bloom for 5 to 14 days on average. But if planted correctly daffodils can bloom for 6 weeks which is good value in these northern parts. The lesson is to plant early, middle, and late flowering varieties thereby extending the season. I developed the daffodil walk above my house on either side of a stone staircase. The land is on a slope and tilts towards the house making a good area to view daffodils from inside my home. Daffodils are a naturalizing bulb which means they will double up and produce more bulbs each year. When you plant the bulbs it’s a good idea to space them out with this in mind; most bulb growers suggest 6 inches apart. In the southern states and some Midwestern states people use jonquil as a common name for the whole genus, but it’s really the species name for a minor group that have multiple smaller flowers on each stem. Narcissus is the Latin name for the whole genus. All daffodils begin with Narcissus followed by the species name. The Poet’s Daffodil, for example, is Narcissus poeticus. Probably the best known poem about daffodils was by the British poet William Wordsworth (1770-1850) whose classic poem “Daffodils” describes the poet viewing “ten thousand” daffodils beside a lake. Greek mythology gives us the term Narcissus. A young Greek named Narcissus was very handsome and quite taken with himself. A nymph called Echo was in love with him, but Narcissus broke off the relationship. Heartbroken, Echo hid in a cave and cried herself to death. The gods were furious at this. Later, Narcissus, seeing his face in a pool, leaned over to see better, fell in and drowned and became the flower. It’s the drooping flower that represents Narcissus at his moment of fatality. Freud embraced the metaphor and developed a theory to describe the narcissistic condition of self-involvement to the exclusions of others. There are nine distinct types of daffodils: trumpet, large cup, short cup, double, triandrus hybrid, cyclamineus hybrid, jonquilla hybrid, tazetta, and poeticus. In choosing daffodils for naturalizing I wanted large tall daffodils so they would show up from a distance. The smaller varieties are better for rock gardens or in beds near the house where you can see them. For my daffodil walk I picked early and mid season, large flowering daffodils. The first bulb I chose was “Ice Follies,” a large ruffled cupped flower which grows 16 to 18 inches in height. These April-flowering Narcissi are known for their 4-inch flowers that have icy white petals surrounding a pale yellow crown that turns white as it matures. The second daffodil I bought was “Mount Hood.” These trumpet daffodils are long-blooming and have trumpets as long as, or longer, than the petals. The 16 to 18 inch daffodil opens creamy yellow and turns ivory white as the flower matures. 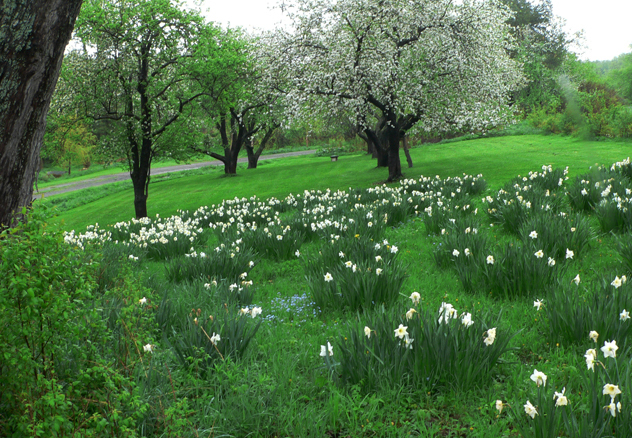 I purposely planted pale daffodils because the hillside of white flowers glows at dusk and, on moonlit evenings, extend the viewing time. One early autumn, with the help of a friend with a backhoe we planted 3,000 daffodils on one side of the stone staircase. Bill sat comfortably on his backhoe, digging irregular trenches in the shape of long clouds. Each hole was dug three times the depth of the bulbs averaging about 6 to 8 inches deep for large-type daffodils. I followed behind Bill, laying the bulbs root side down in the holes, and I pulled the soil and eventually the sod back into place. Being an obsessive type, this planting took me two days to complete, and I was covered in soil and ached for days afterwards. The first year, the bulbs gave a decent display, but it was the second year when they were spectacular. The bulbs had doubled in numbers and seemed taller. The next year, Bill and I planted the other side of the stone staircase, planting 3,000 more bulbs. My wife helped me with the difficult task of pulling the soil back into the holes. A year after planting, I came across some sound daffodil advice by the renowned English horticulturalist and garden designer Gertrude Jekyll (1843-1932) who suggested planting the bulbs in long-shaped drifts instead of round shapes. The drifts should all run in the same direction as this gives a natural feeling to the planting especially in relation to paths or points of view. Each hole should have one variety. I have observed this natural and irregular form of planting in fields of wild flowers and grasses. Each individual drift is repeated over a large area creating contrasting height, color and texture. The vital thing to remember is to avoid planting naturalizing bulbs in a straight line. Also equally important is to leave areas of grass between the drifts of daffodils. The green grass contrasts against the pale flowers and enhances the blooms. Daffodils are best sited in grassland, or in woody places such as under a grove of trees. Because the bulbs naturalize they want to be planted in the wilder areas of your garden. Another good bulb for naturalizing is Spanish bluebell (Hyacinthoides hispanica). These tall, blue, spiked flowers are at home in the woodland and bloom in late spring. Plant tulips, small Narcissi, grape hyacinths, and other small bulbs near the house. The idea is that if a bulb naturalizes and spreads then it needs the room to do so. When looking at nursery catalogs that specialize in bulbs avoid cheap bulb mixtures; these mixes tend to include too many varieties which look haphazard in the landscape. It’s best to keep to 3 to 5 varieties. There are several new firms that specialize in heirloom varieties. These bulbs are pricey but offer some very unusual specimens. Another reason to give over a part of your garden to daffodils is that they are deer and rodent proof. Here are some tips to insure healthy doubling-up of bulbs. Be sure to deadhead the spent flowers so the plants do not set seed as it’s better to let the plant put its energy into making a new bulb. After the bloom period ends, leave the daffodils standing for about 6 weeks so that it can collect the light and nutrients to produce the new bulbs. Do not tie up the foliage as this prevents the leaves from taking in adequate light. After 4 to 6 weeks when blooming is over or when grass overtakes the daffodils you can mow the plants down. In the fall it’s also a good idea to cut the grass in the daffodil area so that when the bulbs emerge in the spring you can view them better. Daffodils are synonymous with spring. Perhaps the legend of Narcissus is to remind us how fleeting beauty and spring are. Having planted a load of daffodils I now take pleasure all year in looking forward to my hill of daffodils announcing the end of the blue-grey funk of winter.